Foodista | Ellen DeGeneres Launches Vegan Website, "Going Vegan With Ellen"
Ellen DeGeneres Launches Vegan Website, "Going Vegan With Ellen"
Ellen DeGeneres just launched a vegan website called Going Vegan With Ellen. The site and its accompanying blog feature tips and tricks on going vegan, celebrities who've successfully made the change and recommended books, blogs and documentaries for those who wish to make a dietary change. DeGeneres' approachable, likable demeanor translates well to Going Vegan With Ellen. 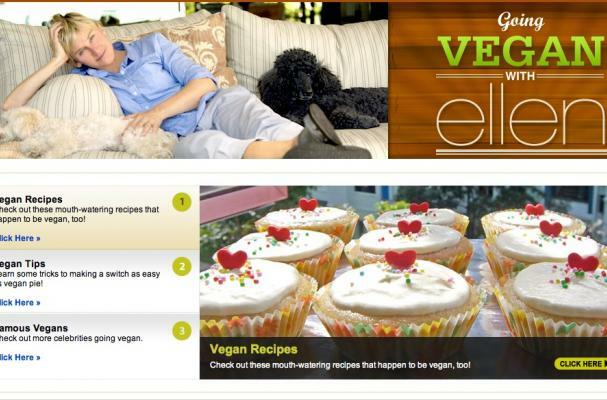 The site's clean design, inclusive, non-preachy content and celebrity ties are sure to make this vegan website shine. WE have lots of recipes and short videos we could offer up to your exciting (and important) website! Congratulations. WE wish you the best of success with this. AllisonBurgess MATCH® premium vegan meats.